Disney’s Paint the Night has said goodbye again. The popular nighttime parade made its way through Disney California Adventure on Wednesday night for the last time of the year. At this point, it isn’t known when it will be returning. However, a recent tweet from DisneylandToday seems to indicate that it is leaving for the holidays. Paint the Night originally came to the Disneyland Resort at Disneyland on May 22, 2015. It was a big part of Disneyland’s 65th anniversary Diamond Celebration. It continued to perform at the Disneyland Resort until the fall of 2016, when it became seasonal. In 2017, the original Main Street Electrical Parade (the parade’s predecessor) returned to Disneyland for a limited run. 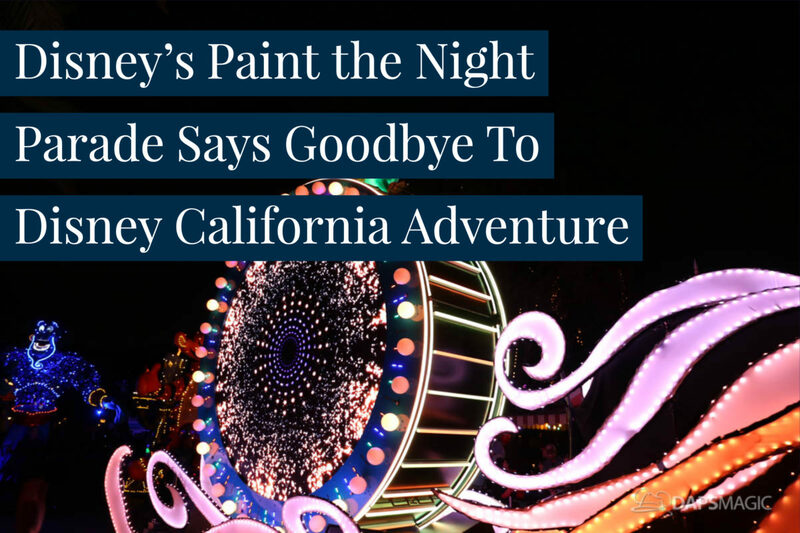 At the D23 Expo in July of 2017, it was announced that Paint the Night would be returning to the Disneyland Resort, this time in Disney California Adventure. The parade began its Disney California Adventure run in April of 2017. In June, a new Incredibles float joined the parade. The run of Paint the Night in 2018 continued through November 7th. This most recent run did not include the Frozen unit and had some of the Little Mermaid unit changed, both due to height restrictions along the parade route. Paint the Night parade is a popular parade and people lined up early throughout the parade’s run. It is the natural successor to the original Main Street Electrical Parade. As it has lit up the night in both Disneyland and then Disney California Adventure, a whole new generation of Disney fans have fallen in love with this magical parade. What was your favorite part of the Paint the Night parade? Do you think it will return to the Disneyland Resort? Let us know your thoughts in the comments below!